A phenomenally popular casual game, Virtual Villagers was originally released in 2006 by Last Day of Work to wild acclaim and an incredibly enthusiastic fan base. It now has a handful of sequels, and the iPhone app, released by Big Fish Games, tries to recreate the same feel as the original, but with a few key differences. 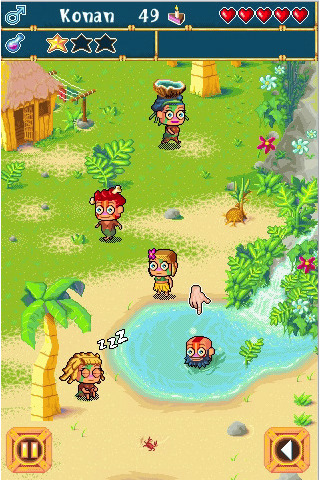 For those who haven’t played a Virtual Villagers game, you are essentially an invisible god-like being with complete control over a little band of primitive castaways on a deserted island. You can pick up a villager and drop them onto certain areas where they will automatically proceed to work: farming, building houses, researching new technology for the village, etc., and it’s your job to make sure that your villagers stay healthy and happy while accomplishing their goals. BUT (and this is VERY IMPORTANT), they will continue to work even when you’re not playing, so you have to keep an eye on things and try to keep everything balanced. It will take a couple of days to get through everything, but most of it will happen without you, as villagers automatically completing tasks over time. Fans of the original will notice that the iPhone app has a much different look than the original game. The graphics have received a major overhaul, including a complete redesign of the sprites. Fond as I am of the original sprites, this is a good thing, as this leaves the game looking much cleaner, but I found the new “ungabunga”-type sound effects a little jarring, and it makes the game feels a lot goofier than the original. The controls are a little imperfect, sometimes requiring several tries before you can grab a villager, and the map can be difficult to get around. There are new mini-games associated with each task, even parenting (for those of you who get a kick out of breeding the little guys). In general, I liked the mini-games; they added a level of interaction needed to keep the game fun on the iPhone, but they often lagged a lot, even crashing the game on occasion. Load times can also be a bit painful, especially if you’ve neglected your village for awhile, but because the game is so large and robust, it’s an easy thing to excuse. I know it sounds like a lot of complaints, but, seriously, folks, this is a very substantial and involved game, and for the absurdly low price of $.99, Virtual Villagers is more than worth it. Do yourself a favor and try it out. AppSafari review of Virtual Villagers: A New Home was written by Tracy Yonemoto on March 30th, 2010 and categorized under App Store, Featured, Fun, Games, Mini Games, Resource Management. Page viewed 6662 times, 2 so far today. Need help on using these apps? Please read the Help Page. I liked this game and stupidly got VV2 and VV3 one late night without really looking at it and realizing it’s not the same at all. Gotta say, I prefer the simplicity and cute factor of this one.